If you know how to create Windows applications using Visual Basic, you’re ready for this 5th Edition of our classic web programming book. It will get you off to a fast start whether or not you have done any web programming. It will teach you the skills you need to develop bullet-proof web applications on the job. And when you’re done, this book does double duty as the best on-the-job reference that money can buy. To get you off to a fast start, this 5-chapter section shows you how to use Visual Studio to design, code, and test multi-page web applications that get database data and manage session state. Along the way, you’ll see where HTML5 and CSS3 fit in, so you can tweak that code as needed. This is the essence of ASP.NET Web Forms programming, and this prepares you for rapid progress in the sections that follow. This section teaches you how to use the rest of the server and validation controls…more about state management…how to build and format pages using master pages and themes…how to make a site easy for users to navigate…and how to use friendly URLs that improve search engine results. These are the features that you’ll use all the time. In this section, you’ll learn how to use SQL data sources and five ASP.NET controls…GridView, DetailsView, FormView, ListView, and DataPager…to develop professional database applications with little or no Visual Basic code. Then, you’ll learn how to use object data sources to create 3-layer applications that let you separate the presentation code from the data access code. In this section, you’ll learn skills for polishing up your ASP.NET applications. Like: how to secure an application and authenticate users…how to handle back-button refreshes…how to send email…and how to deploy a web application on a remote web server. This section shows you how to use ASP.NET Ajax to develop rich Internet applications and how to create and consume WCF and Web API services. This section also introduces you to ASP.NET MVC…a completely different approach to web programming than Web Forms…so you can decide if you want to learn more about it. If you have a core set of Visual Basic programming skills...the kind you get from a book like Murach’s Visual Basic 2012...you’re ready for this book. In fact, we’re confident that it will teach you ASP.NET faster and better than any competing book. That’s true whether you’re new to web programming or whether you’re coming to it with a background in another server-side language. Since HTML5 and CSS3 are now an integral part of ASP.NET applications, we’ve moved the chapter on HTML/CSS from chapter 5 to chapter 3. We’ve also updated all the applications in the book so they use HTML5. We’ve added friendly URLs to the chapter on site navigation, so you can use them to improve the search engine results for your sites. We’ve added material on Web API services to the WCF services chapter, since it’s another popular way to provide services that other websites can use. We’ve added an introductory chapter on ASP.NET MVC, which is an alternative to ASP.NET Web Forms that Microsoft has been promoting, so you can decide whether you want to learn more about it. Of course, we’ve also updated the material and improved the instruction throughout the book. But that’s something we always do when we publish a new edition of a book. Like the full editions, this Express edition includes the Visual Studio development environment, version 4.5 of the Microsoft .NET Framework, Visual Basic 2012, and SQL Server 2012 Express LocalDB. Although the Express edition has a few differences from the full editions, this book carefully notes those differences. The good news is that all the skills that you learn with the Express edition will still work when you’re using one of the full editions on the job. To develop ASP.NET applications, you can use any of the full editions of Visual Studio 2012. These editions come with everything you need, including Visual Studio, Visual Basic 2012, a built-in web server called IIS Express that’s ideal for testing ASP.NET applications on your own computer, and a scaled-back version of SQL Server called SQL Server Express LocalDB. For a no-cost alternative to the commercial packages, you can download Visual Studio Express 2012 for Web from Microsoft’s website. It too provides all of the items listed above, it’s a terrific product for learning how to develop ASP.NET applications, and both the applications and the skills that you develop with it will work with any of the full editions of Visual Studio. 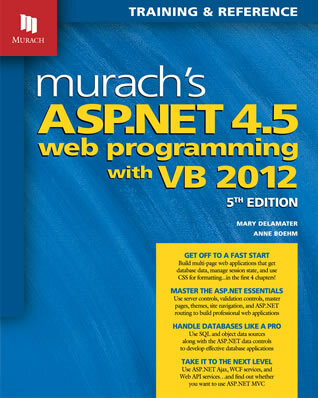 Murach’s Visual Basic 2012 is the perfect companion to our ASP.NET 4.5 book. It presents the Visual Basic programming skills that you need for developing ASP.NET web applications. It works for beginners as well as professionals. It lets you learn new skills whenever you need them. And it’s the best on-the-job reference that money can buy. "This is a fantastic book that gets you building powerful web applications with ASP.NET 4.5 – quickly and efficiently. True to form with the rest of Murach's library, the lessons are very comprehensive but not intimidating, focusing on specific tasks and organized very logically. It's a proper rundown of the concepts and code that beginners will treasure and experienced developers will appreciate, too." What about Visual Studio 2013? This chapter gives you the background you need to start writing ASP.NET 4.5 web applications of your own. So you’ll find out how web applications work, what software you need to develop them, and how the code that represents the design of a web form is coordinated with the Visual Basic code that makes the web form work the way you want it to. This chapter teaches you how to use Visual Studio 2012 to design, code, and test a one-page web application. That means you’ll see how to build a web form using web server controls and HTML server controls, how to check for acceptable user input using validation controls, and how to write the Visual Basic code for the web form’s code-behind file. Visual Studio 2013 has a few nasty but relatively minor effects on what is taught in our ASP.NET 4.5 books. For this reason, we recommend that you use VS 2012 while you’re learning from our book. If you do upgrade to VS 2013, though, here are the changes that you need to deal with. One of the new directions of VS 2013 is the concept of “One ASP.NET.” That means that Microsoft wants the creation of all ASP.NET project types to work similarly. As a result, VS 2013 provides only one option when you create a new application: ASP.Net Web Application. Then, within that option, you can select a Web Forms, MVC, Web API, Single Page Application (SPA), or Facebook project. This eliminates the choice between starting a website or a web application, and it changes the way you start a new web application. It also changes the way ASP.NET special folders are used. In particular, there isn’t an App_Code folder and the code in a web application doesn’t need to go into it. This will also change the way an application is deployed because a web application needs to be compiled before it is deployed. With VS 2013, there is no development server for testing applications. As a result, you will always use IIS Express instead of the development server. Although this won’t change the way you create new web applications, this will change the way you open and use the downloadable applications and exercises for this book. Because Microsoft gets a lot of criticism about their frameworks being bloated and plodding, Microsoft is trying to be more modular. For instance, the Entity Framework is already a Nuget package. As part of this new modular direction, the Website Administration Tool has been removed from VS 2013. This is partly because of the new Identity architecture, but also because the Website Administration Tool uses the development server, and Microsoft hasn’t updated it to work with IIS Express. Then, you can use the Membership system too. With this as background, you can see why we recommend that you don’t upgrade to VS 2013 until you’re through with our book. That way everything will work just as it is described in the book. After you finish learning ASP.NET 4.5 with VS 2012 from our book, you can upgrade to VS 2013 whenever you want to...after it’s clear that all of the features of VS 2013 are ready to go. Then, because you’ve already read our book, you will have all the skills and concepts that you need for making that upgrade with relative ease.